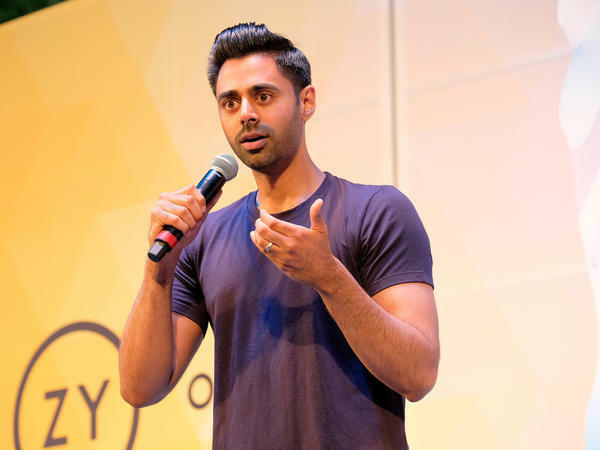 Hasan Minhaj performs in New York City in July. The Saudi government asked Netflix to remove an episode of the comedian's show Patriot Act that was critical of the regime over the death of Jamal Khashoggi. Last fall, the world watched as Saudi Arabia's official story about the death of Washington Post columnist Jamal Khashoggi changed, and changed again. A series of contradictory claims and denials came even as evidence emerged that Khashoggi's killing had been ordered by the country's crown prince. Many people were angry, and that included the American comedian Hasan Minhaj, who blasted the Saudi government on his Netflix news-comedy show Patriot Act with Hasan Minhaj. "This is the most unbelievable cover story since Blake Shelton won sexiest man alive," Minhaj joked to his audience. But the Saudi government isn't laughing. Last week, it had Netflix remove the episode in that country. As the Financial Times first reported, a Saudi regulator cited a law that prohibits the "production, preparation, transmission, or storage of material impinging on public order, religious values, public morals, and privacy, through the information network or computers." In a statement to NPR, a Netflix spokesperson said, "We strongly support artistic freedom and removed this episode only in Saudi Arabia after we had received a valid legal request — and to comply with local law." The episode was also posted to the show's YouTube page, which is reportedly still accessible inside Saudi Arabia. Google, which owns YouTube, didn't immediately respond to questions about whether it had also heard from the Saudi government. In the episode, Minhaj called Saudi Arabia's actions a "cover-up" and went on to question the deep financial and political ties between the U.S. and Saudi Arabia, the country's involvement in Yemen and crackdowns on women's rights advocates. In an interview with The Atlantic about his show, Minhaj said he and his family discussed the potential repercussions of his criticism of the Saudi government, and that he now has fears about his own safety. News of Netflix's decision was met with some criticism, including from the Washington Post's global opinions editor, Karen Attiah, who called it "quite outrageous." This isn't the first time Netflix has removed episodes of a show at the request of a foreign government. According to a Netflix spokesperson, Singapore objected to three Netflix shows — Disjointed, Cooking on High and The Legend of 420 — because they have positive portrayals of drug use which is highly restricted in the country.